VATICAN CITY (CNS) — Despite its many positive advancements, globalization also has brought about greater indifference, exploitation and suffering, said the leaders of the Pontifical Council for Interreligious Dialogue. Christians and Hindus must work together urgently to help foster of “culture of inclusion for a just and peaceful society,” they said in a written message. Cardinal Jean-Louis Tauran and Father Miguel Ayuso Guixot, respectively the president and secretary of the council, extended their best wishes to the world’s 1.1 billion Hindus for the feast of Diwali, a three-day religious festival, which was to begin Oct. 23 in most parts of the world. The festival focuses on the victory of truth over lies, light over darkness, life over death and good over evil. 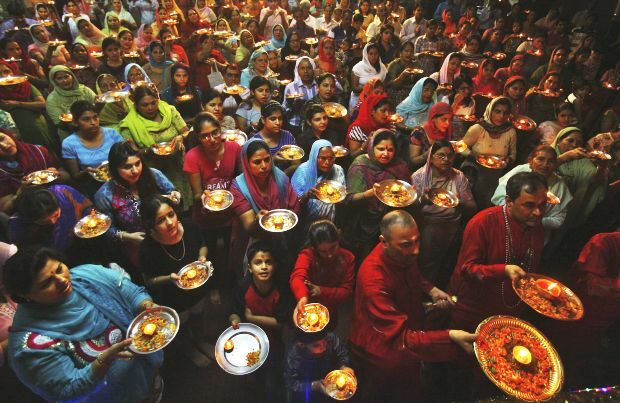 The message to Hindus was released Oct. 20 by the Vatican. “In the face of increasing discrimination, violence and exclusion throughout the world, ‘nurturing a culture of inclusion’ can be rightly seen as one of the most genuine aspirations of people everywhere,” the message said. Despite globalization’s many positive developments — like better educational and health care facilities, a greater awareness of the values of democracy and social justice — it has brought big problems, too, it said. “Globalization has contributed significantly to many peoples losing their socio-cultural, economic and political identities,” it said. “Religious fundamentalism and ethnic, tribal and sectarian violence in different parts of the world today are largely manifestations of the discontent, uncertainty and insecurity among peoples, particularly the poor and marginalized who have been excluded from the benefits of globalization,” it said. “Widespread materialism and consumerism, moreover, have made people more self-absorbed, power-hungry and indifferent to the rights, needs and sufferings of others,” leading to what Pope Francis has called a “globalization of indifference,” which makes people numb to the suffering of others, it said. Such indifference and exclusion mean “the poor, marginalized and vulnerable are denied their rights, as well as the opportunities and resources that are available to other members of society.